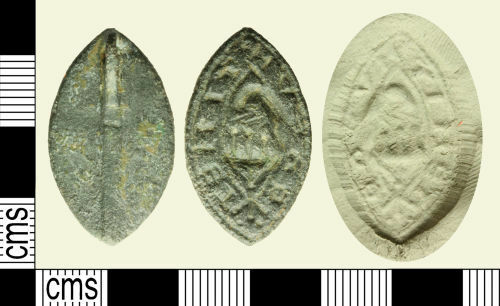 A copper alloy medieval seal matrix dating to the period c. AD 1250 - 1300. The seal matrix is a pointed oval shape and features a D-shaped integral pierced lug on the reverse. There is a longitudinal ridge extending from the bottom of the pierced loop to the tip of the seal matrix on the reverse. The matrix depicts a pelican in her piety, the pelican piercing its own breast to feed its chicks in a nest below, the nest resting in the upper branches of a larger branch. Surrounding the central motif is the legend [...] DEVM TIM ET The pelican in her piety is a motif known to be a symbol of Christ's sacrfice to mankind. The majority of pointed oval shaped personal matrices appear to date from the mid to late 13th century (Cf. Harvey & McGuinness 1996: 79-88). The seal matrix measures 29.41mm in length, 17.21mm maximum width, 2.58mm minimum width and is 3.03mm thick, not including the pierced lug and 5.82mm thick including the pierced lug. It weighs 6.45g. Cf. BUC-EE13A4, IHS-6720D3, IHS-7B4697 & HAMP-F1A5D8 for similar examples on the database.